1 Arrange bread on baking sheet. 2 Combine Hellmann's® or Best Foods® Real Mayonnaise with barbecue sauce. Spread the mayonnaise mixture on bread. 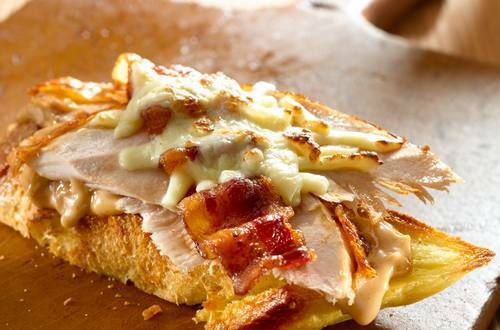 Arrange turkey on bread, then top with cheese and bacon. 3 Broil 1 minute or until cheese is melted. TIP: To add sauteed mushrooms, melt 1 tablespoon I Can't Believe It's Not Butter!® Spread in 12-inch nonstick skillet and cook 1 package (10 oz.) sliced mushrooms, stirring occasionally, 6 minutes or until golden. Season with salt and pepper to taste, then add to sandwiches before adding bacon and cheese.